I don’t know whether owning shares in Pizza Express is a thing but quite possibly my family does a good job of keeping their business afloat. 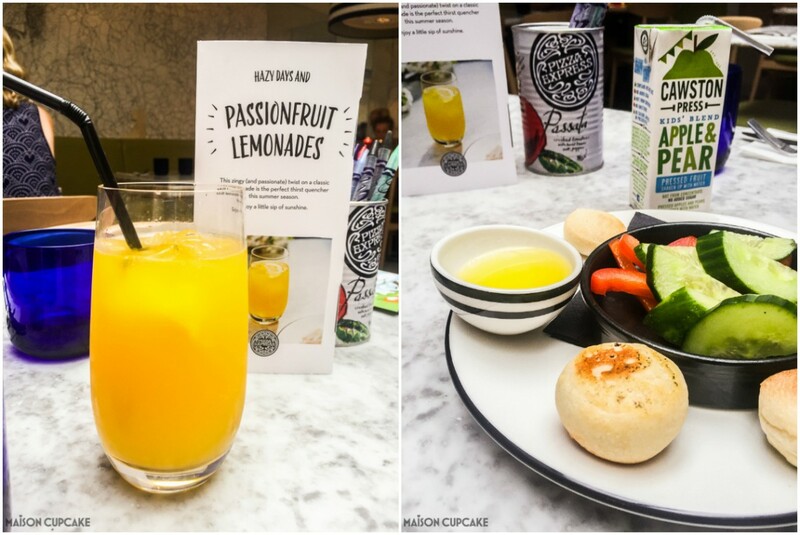 We tend to visit at least once or twice a month anyway so I was happy to accept a recent invitation to come in and try items on the new Pizza Express summer menu. 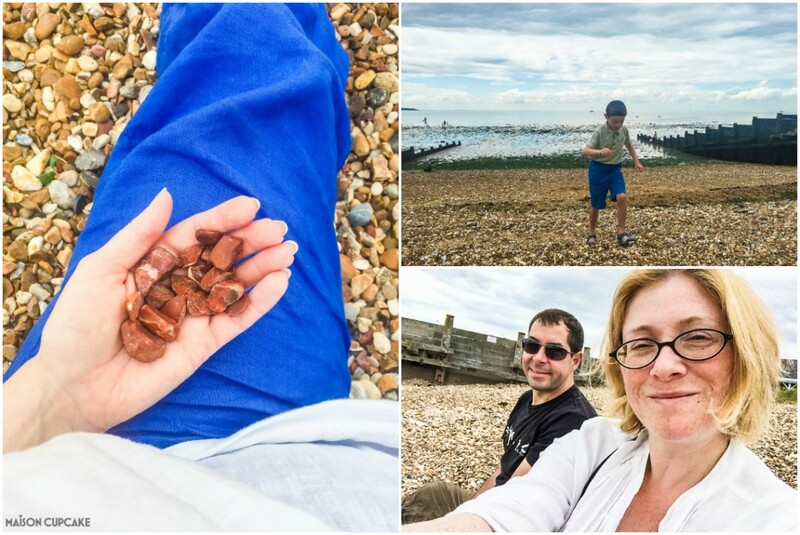 We visited the Whitstable branch of Pizza Express on a Sunday during July. Whitstable is an increasingly chic Kent fishing town with a thriving high street you’d expect Mary Portas to rave about. It’s our fantasy to move there one day but for the time being a 75 minutes’ drive fulfils our seaside fix. Many a twitchy Sunday morning we zoom down the M2 in the car and typically we land in Pizza Express for lunch before sitting on the pebble beach or perusing the shops. Ted is still small enough to stick with the kids menu – above right the crowd pleasing dough balls and five a day nudging salad. Passionfruit lemonade was the first summer special on the menu, a zingy refreshing fizz in honour of the Rio Olympics next month. Passionfruit is one of several tropical fruits native to Brazil. Ted’s typical choice is La Reine i.e. ham, mushroom and black olives on a margerita cheese and tomato base. He also likes the Cawston Press juices served alongside the kids menu. Here is the Barbecoa Romana limited edition pizza on a Romana style thin crust base. 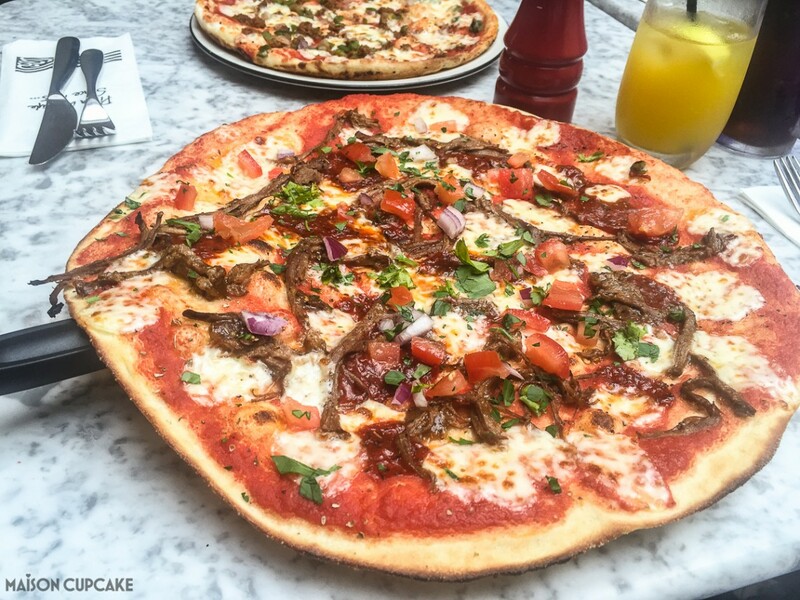 It’s topped with smoky pulled beef, spicy chipotle salsa, passata and fresh pieces of tomato, red onion and coriander. Brazil is famous for dry rubbed barbecues; my meat loving husband dreamily reminisces about his visit there once where restaurants had “Stop / Go” signs on the tables commanding serving staff to keep bringing more meat until you beg them to stop. I’m going to miss this one when it disappears in mid September. I do love a bit of barbecue sauce and the pulled meat made a change to the usual chunks on their Sloppy Guisseppe. 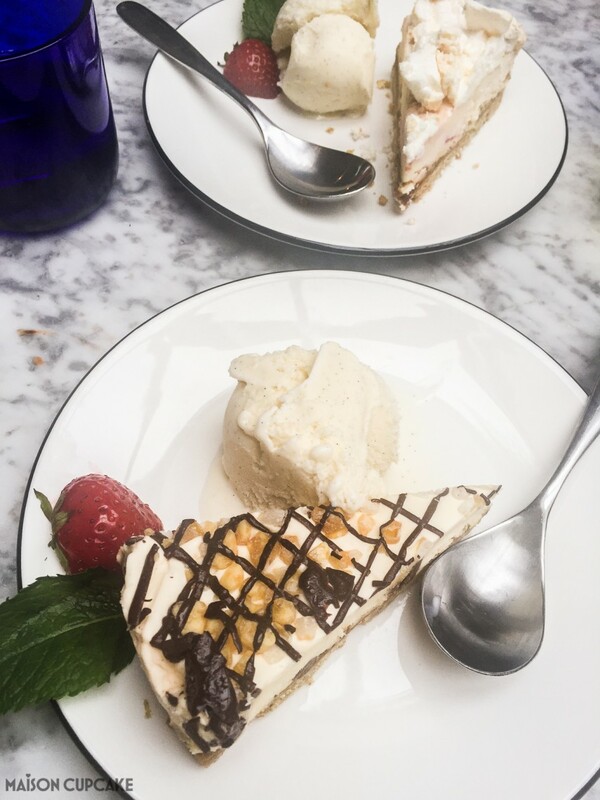 Time for dessert and at the back we’ve got the summer special Eton Mess Cheesecake – brought back by popular demand – and strawberry swirled cheesecake topping with crumbled meringue and shortbread base. At the front you have my choice, the honeycomb cream slice with vanilla gelato criss crossed with dark chocolate. Both are served with a scoop of vanilla ice cream. Our service had been efficient and friendly throughout. The restaurant was not especially busy that day although other Sundays it has been. The staff behind the pizza counter all call out a friendly goodbye as you leave. 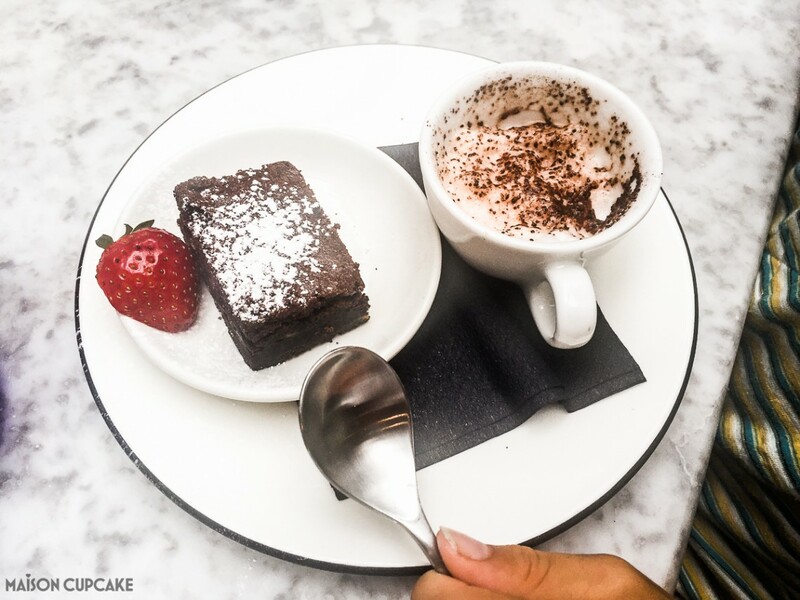 What I really like about Pizza Express is how they mix long term favourites with new seasonal options. It’s great that you get a handful of surprises alongside old favourites. 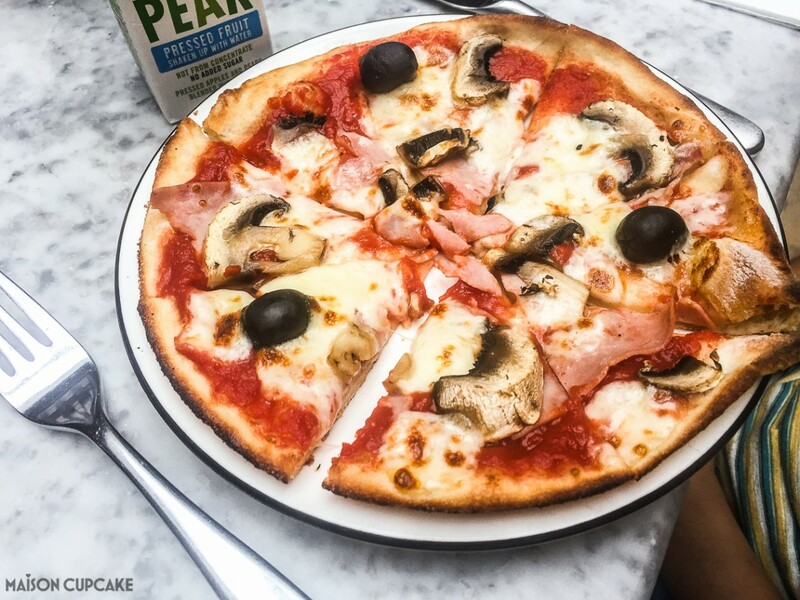 There seem to be more Italian chain restaurants than any other type but Pizza Express, founded back in 1965 have become as much as British favourite as Boots or WHSmiths. I suspect they’ll outlive them both. I’ve heard it said that Pizza Express crosses all boundaries; from business lunches to kids birthday parties. Certainly every supermarket seems to sell Pizza Express gift cards these days and like the aforementioned Boots or WHSmiths, this is as as good as currency nowadays. No visit to Whitstable is complete without a therapeutic fiddle with pebbles on the beach. Please husband can we move here? With thanks to Pizza Express for our complimentary meal to try new items on their summer menu.